A tour de force of imagination, Bones of the Lost is a roller coaster of plot twists, punctuated by Tempe’s fierce wit and forensic know-how. “A genius at building suspense” (New York Daily News), Kathy Reichs is at her brilliant best in this sixteenth installment of the Temperance Brennan series. 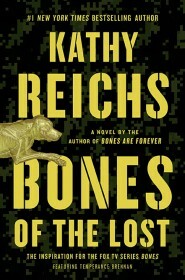 With the Fox series Bones in its ninth season, Kathy Reichs has reached new heights in suspenseful storytelling.